The 1979 Miami Dolphins season was the 14th year of existence for the Miami Dolphins franchise. 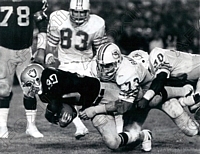 Prior to the start of the season the Dolphins re-signed Larry Csonka who left to join the WFL after the 1974 season. Despite struggles from Bob Griese all year, the Dolphins finished 10-6 and won their first division title in five years. Among the season highlights were the Dolphins 19th and 20th consecutive wins over the Buffalo Bills. For the entire decade of the 1970s (1970–79) the Dolphins hold a perfect 20-0 record over the Bills, which contributed to O.J. Simpson never seeing any postseason success in his career. In the Divisional Playoff the Dolphins were no match for the Pittsburgh Steelers who jumped out to a 20-0 lead in the 1st Quarter to win 34-14 on their way to their second Straight Super Bowl title. Larry Csonka returned to the Dolphins in 1979 for one last season before retiring, after leaving in 1975 for the World Football League and spending the next three seasons after with the New York Giants. He led the team with 837 rushing yards and 12 touchdowns, in addition to one receiving touchdown. His return led to him being named the NFL Comeback Player of the Year. ^ "1979 Miami Dolphins draftees". Pro-Football-Reference.com. Retrieved December 20, 2014. This page was last edited on 30 August 2018, at 01:51 (UTC).